Two decades ago, the terms virtual reality and augmented reality barely existed. These were concepts that you’d only see in science fiction films or television shows. Fast forward to today and you can see the presence of these technologies in nearly every industry. Having roots in the video game space, VR and AR technologies are now present in industries such as real estate, marketing, defense, education, medicine, research, and finance. In the United States alone, nearly 23 million Americans are already using VR technologies and the AR market is expected to reach $61.39 billion USD by 2023. If there’s one clear takeaway from these numbers, it’s that VR and AR are going to be key drivers of business and innovation; both of which are essential in Chicago’s mission to become the next global tech hub. Here at 1871, our mission is to inspire, equip, and support founders to build great businesses. We’re fortunate to operate in a city with leading corporations, phenomenal investors, top universities, and a strong ecosystem of innovators and entrepreneurs. To expand that ecosystem along with our community, we’re always on the lookout for transformative technologies, and it’s abundantly clear that VR and AR solutions are already changing the way that organizations operate throughout the world. As a growing innovation hub, our community serves as a lab for pioneers in the VR and AR space, and we couldn’t be more excited to see what they can achieve with the full resources of the city of Chicago behind them. As we move into the New Year, we at 1871 are thrilled to play a role in the growth of Chicago’s VR and AR community. Beginning on January 16, 2019, 1871 will host a series of VR/AR Chicago events on a monthly basis. I’m confident that this will be a step forward for Chicago’s VR and AR community, which includes numerous developers, industry leaders, and entrepreneurs, and as a result, will help the city expedite its growth onto the national and world stage as a leader in technology and innovation. I’m also confident that our tech community, which is built upon the pillars of support and encouragement, will be of great benefit to those who visit. The story behind ‘1871’ isn’t about the Great Chicago Fire of 1871. It’s about what happened next; when engineers, innovators, and inventors came together to build a new city. We invite you to help us write the next chapter. Chicago has earned its reputation as “The City that Works,” an honor that holds true for Chicago’s immersive technology culture as well. 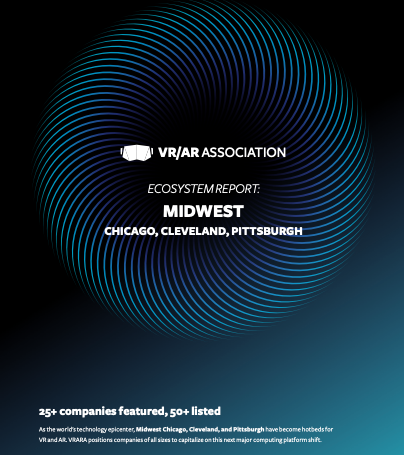 With a growing community of Virtual and Augmented Reality professionals and organizations, the focus in Chicago is on delivering cutting-edge XR technology to institutions that can make beneficial use of it. It is Chicago's pragmatic, get-it-done style that will propel the city to be the next global hub for innovation, and XR technology will be a major part of that growth. Chicago is already a world class leader in global business opportunities. Home to several headquarters of the world's largest corporations, top universities, world-class entertainment, advertising, and media and a thriving venture investment community - the environment is primed for VR and AR innovators to engage with opportunities. Add in the city and state government embracing their roles in developing the city as a technology hub, and it’s hard to find a better place to grow new technology solutions. Beyond the venture capital, talent, and technology ecosystem that exists, the one factor that sets Chicago apart from everywhere else is culture. The city is rooted in hard work, dedication, and discipline. It's often referred to as a big city with a small town feel, because anyone with the grit to put in the work has the ability to succeed in Chicago. And the community exists to help people achieve their goals. There are dozens of free networking and MeetUp groups in Chicago dedicated to technology - many VR and AR specific - that meet regularly for the purpose of helping others move forward in gaining education, experience, or finding work or developers to help them take their next step forward. We welcome you to come and visit, and see what Chicago has to offer. Pittsburgh is situated at the nexus of technologies that will shape the future. Dubbed “Roboburgh” for its strengths in robotics, it is also a powerhouse in artificial intelligence and machine learning. Carnegie Mellon University’s Entertainment Technology Center and Schell Games provide a solid foundation for XR in gaming, entertainment, and education; the region’s history of manufacturing—particularly in conjunction with robotics—makes it ripe for implementation of XR in industry. Moreover, Pittsburgh is widely regarded as a major healthcare and biomedical innovation hub. Add to the mix the local culture of entrepreneurship, community-mindedness, and social responsibility, and the city emerges as a potential rising star in XR. The Pittsburgh Chapter of VRARA aims to build upon these foundational strengths, to support practitioners and users, and to create networks that will propel research into and implementation of XR in the region.